Find the prize in Gator's mound. Find the friend from good unbound. Where all is never what it seems. As the avalanche subsides, Richard continues to search for signs of Zard, but to no avail, and comes to the grim conclusion that the Guardian is dead. But then as he turns to his friends, he heards a gritty sounds and turns to see Zard approaching them from the left side of the cliff, carrying a giant battleaxe. The Guardian explains that he had to roll a large rock to the side to retrieve his weapon, and in doing so he had caused the avalanche, which he managed to escape before it grew too large. With Zard safe, Richard says that they should get away from Cragmar's Plateau quickly and asks Melek to read the next prophecy. Realizing they should find Gator's mound to find a pod, the group begins to head down from the pleateau, following a small stream that headed down a slope. Eventually, the small stream grows into a stagnant river with clumps of vegetation growing beginning to dot the landscape. They have arrived in a swamp, and the Path Finder points to a large hillock settled inside the morass. They try to use several small islands as stepping stones across the waters, but the unreliable sturdyness of the islands forces them to wade through the waters eventually. The journey through the water is unpleasant, as the heroes feel creatures slime around their legs beneath the waters and Richard is forced to carry the Book of Prophecies so Melek wouldn't drown. Eventually, they stop to take a breather, while hoping they wouldn't need to go back the way they came. Just then, Richard feels a tingling on his arm and looks down to see several slug-like creatures latched on his skin, suckling on his blood. He tries to bite one off when Zard stops him, saying those things are leeches and that the wound will be infected if he tries to tear them off. Zard states that the only way to get rid of the leeches - which are covering him too, as well as Melek and Orkan - is to burn them, and proceeds to try to get a fire burning in the damp environment. Using some relatively try twigs for fuel, he scrapes his axe against a rock to get a spark going. Eventually, he manages to ignite a small blaze and asks Richard for his arm. Using a smoldering reed, Zard burns the leeches, which promply drop off the skin without trouble. After getting rid of several more leeches all over Richard's body, the Guardian does the same for Orkan and Melek before letting Richard do him. The group then gathers a certain type of leaf to rub over their wounds to numb the pain and prevent any infection. 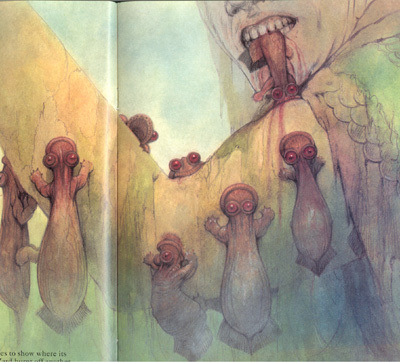 Suddenly, a voice calls out from the swamp and orders the group to drop their weapons. Orkan doesn't hesitate and does so, which Richard and Melek hesitate. The voice demands Zard to drop his axe, but the Guardian doesn't comply and orders the voice to show himself. Moments later, a lizardman emerges from behind a pile of rotting logs. Zard orders him to come closer, and the lizardman does so, finally recognizing Zard's face. 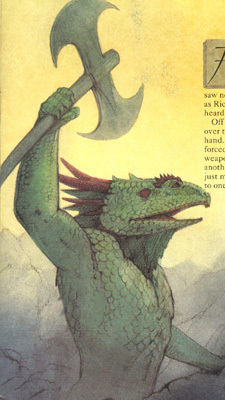 The lizardman gives a signal, and a small band of lizardmen emerge from hiding, all brandishing weapons. The lizardman leader identifies himself as Fengal, and identifies his recognition of Zard as a Guardian and Richard as the Chosen One. Fengal states he and his men are on their way back to the Ancestral City, but Zard says that they are needed here to help them retrieve a pod at the hillock they've been approaching. 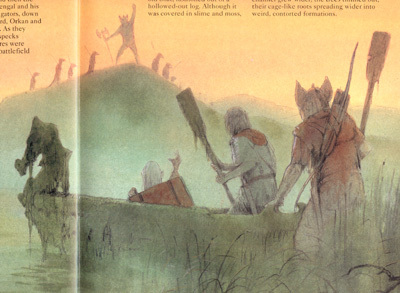 Fengal says that he and his men have encountered several forces of the Evil One in the swamp, and that their leader is located on that very hill. After discussing some things, the trio, the Guardian, and the lizard forces head towards the hill, occasionally hearing slithering noises in the swamp all around them. Soon they arrive at the hillock, and they see their enemy: a mob of alligator soldiers, well armed and armored. Behind them, sitting on a nest of branches, is a large alligator, who identifies himself as Gator. Gator orders his men to attack, and in a few moments the lizardmen are in a fight for their lives against Gator's fierce mob. 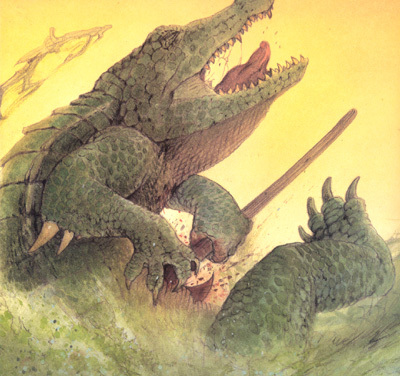 The alligators quickly overpower Fengal's men, which begin to fall one by one to Gator's army. During the commotion, Richard decides to take the initiative and begins to work his way around the field of combat, heading towards the back of Gator's best. Gator doesn't notice Richard heading his way, but Orkan does. Orkan, believing Fengal is doomed to die, and that the Evil One is his true master, comes to the conclusion that he must kill Richard and begins following the Chosen One. 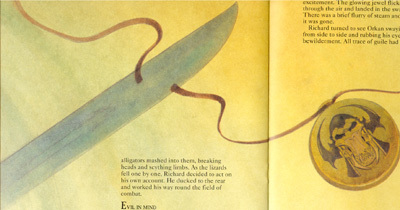 Richard manages to get behind the distracted Gator and raises his dagger, hoping to sink it into the creature's neck, but before he can Orkan gets behind him and grabs his arm, causing Richard to lurch backwards. His blade cuts through the air and slices through a silk thong around Orkan's neck, a thong holding an amulet engraved with a horned emblem. The amulet falls to the ground and land in the swamp water, hissing upon impact before disappearing. Richard turns behind him to see a dazed Orkan, who asks what was going on. Richard realizes that his friend has returned to normal and concludes aloud that the amulet must've been a trap set by the Evil One. He then remembers his mission and returns his gaze to Gator, who was now standing up directing his troops, still unaware of Richard's presence. Richard spots the Life Force pod sitting in the alligator's nest and plucks it from the creature without being seen. Unable to kill Gator anymore, the Chosen One and his friend slip away back towards the battle. As they do, the remainder of Fengal's forces manages to cut a swathe through Gator's men. Seizing upon this opportunity, Zard charges into the fray with his battleaxe swinging. In fear, the alligators flee back to their leader. Gator takes charge and lunges into the battlefield, swinging his tale in a vicious swipe at the Guardian. 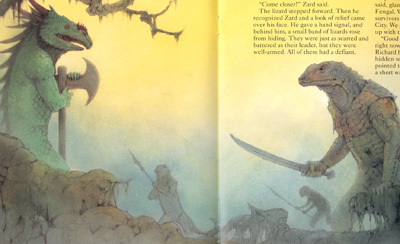 Zard ducks, and Gator's tail strikes and kills one of Fengal's men. 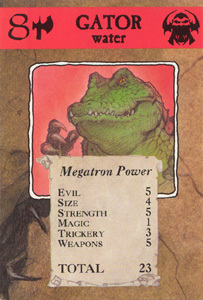 As Gator prepares for another strike, Zard swings his battleaxe with all his might and sinks it deep into Gator's chest. Gator falls to the ground, dead. With Gator no more, the Evil One's spell over his men disappears, and the alligators emerge once again, in a daze as unwilling to fight. Now Zard may take them, as well as Fengal's surviving me, back to the Ancestral City. With the battle over, Zard approaches Richard and says that now they must part so Richard may finish his quest. Richard pulls out the Path Finder and the instrument points in a direction that Fengal states leads to the sea. The trio gives their farewells to Zard and his troops before the two parties part, with Richard, Orkan, and Melek heading over the hillock. Thankfully, the waters on the other side of the hill weren't as dangerous as the trek into the swamp, and as they head down towards the cleaner-looking waters, they spot something sitting under a tree. To their luck, it is a boat carved out of a tree trunk, just large enough to carry all three of them out of the swamp. After making sure the boat is secure enough to float, the trio hop into it and use makeshift paddles to push themselves down the water towards the sea. Eventually, the swamp begins to thin out as silence overtakes their journey. Fatigue begins to set in for the trio, and though they try their best to stay awake, Melek and Orkan fall victim to their tiredness first. Richard tries desperately to remain awake, but eventually even he succumbs to his fatigue, and the boat slowly drifts out to sea. Gator is an enormous alligator that dwells within a large swamp. Like Dragora, Gator holds command over an army of lizard creatures of the Ancestral World, only his minions are alligators instead of regular lizards. Gator is also the protector of one of the stolen Life Force Pods, which he keeps stored in his nest. He is a fierce and powerful opponent with raking claws, powerful jaws, and a whip-like tail at his weapons, and he isn't afraid to take on an enemy head on. 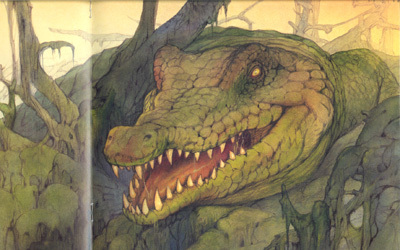 "Behind them, an enormous alligator sat on a rough nest of branches and, as Richard looked at the deep-set yellow eyes, the long snout, the killer teeth, he felt a gush of terror run through his body." 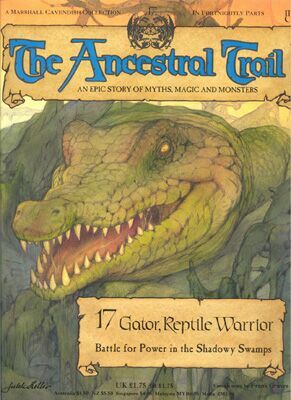 In the seventeeth issue of The Ancestral Trail, things begin to pick up the pace as Richard and his friends locate another Life Force Pod, this time in the possession of Gator. This also coming almost immediately after freeing Zard from Cragmar in the previous issue. By the current count, four pods have been located and three Guardians have been saved, meaning two pods and three Guardians remain. With only nine issues remaining in the first Ancestral Trail, series, how and when will Richard locate the remaining pods and Guardians? Also in this issue, Orkan finally returns to normal when Richard inadvertantly removes the amulet that kept Orkan under its control. It turns out that the amulet, which bore the mask of the Evil One, was a trap left by the Evil One in case anyone was foolish enough to take it upon defeating Dragora. The amulet seemed to work by first preying on the selfish feelings inherent in everyone, bringing them to the surface and causing a person to think of himself. When he is comfortable with these feelings, the Evil One takes hold, molding that person into one of his minions to do his bidding. Zard: "Don't touch it! It's a leech. If you pull it off, its teeth will stay embedded in y our arm. This place is crawling with germs and bacteria. If the leeches don't such you dry, gangrene will set in before another day is out. The only way is to burn them off." Richard: "How are we going to burn them off here? Everything's so damp." "Now. Find as many of these [leaves] as you can and rub them over your wounds. The juice will take away the pain and stop them going septic." Fengal: "A Guardian and the Chosen One! Surprises never cease. My name's Fengal. We've heard that many other survivors are regrouping at the Ancestral City. We are making our way there to join up with them." Zard: "Good for you, but right now you could be more help to us. Richard has to retrieve a pod which is hidden somewhere up there." Fengal: "If you're going in there, you'll really need help. We've battled with a few of the Evil One's forces in the swamp already. Their leader is in there. What do you want us to do?" "Welcome to my Kingdom! I am Gator. Whisper my name as you die. Get them!" Richard: "I don't know, but I think everything is going to be all right now." Orkan: "I feel very dizzy." Richard: "It was that amulet. It must have been a trap set by the Evil One. It changed you completely."